Hard to find shot glasses are dark green on milky white. Stand 7.5 cm tall dia 5.5 cm. Tumbler has been used occasionally and stands 9.5 cm tall, width 8 cm. 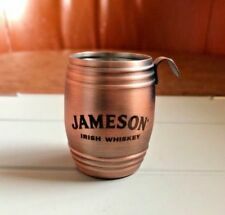 Nice set for all Irish whiskey lovers! 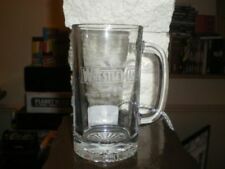 VINTAGE 1990's LONDON DUNGEON SHOT GLASS (NEVER USED) - PERFECT CONDITION! It is a standard size shot glass with the London Dungeon logo on one side, and a hooded skull on the other size. Dalwhinnie Scotch Whisky shot glasses. Would pass for new. No signs of use. each glass. with heavy base and etched logo. Rounded square shape. 'MALTS OF SCOTLAND'. 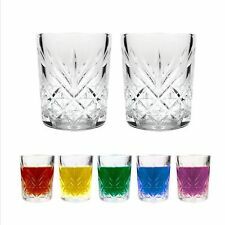 2 SHOT GLASSES. (foot of glass). Height 6.75cm. Lovely Old Horn Drinking Cup. Mid Century shot glasses featuring a ring-necked pheasant about to take flight. Laphroaig Glass / Tumbler / 3.5” High / 2” Wide / Excellent Condition. Laphroaig Glass / Tumbler / 3.5” High / 2” Wide / lovely small glass with heavy base. Excellent Condition.. Dispatched with Royal Mail 2nd Class. For sale - three lovely, vintage graduated amber glasses in very good condition - no chips, cracks or scratches from use. This set were made in England in the 1960s, they have a nice thick heavy base and are wonderfully weighted. The smallest measures roughly 60mm tall and roughly 45mm across the rim. The middle size measures roughly 80mm tall and roughly 60mm across the rim. The largest measures roughly 95mm tall and roughly 70mm across the rim. Thank you for looking. Each glass shows a different Scottish scene. Glasses in immaculate unused condition, Box is Scruffy. All In the original Box. The base of the glasses have France embossed on them. Vintage Whisky Shot Glass, "It's a Sair Fecht"
Laphroaig Shot Glass. Condition is used, but like new. Dispatched with Royal Mail 2nd Class. Jacobean pattern. Heavy weight glasses in excellent condition. 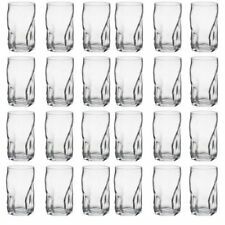 36 x Glass Shot Glasses 12oz (3 Boxes Of 12). Glasses have been used but are in very good condition. Lovely shaped glass with solid base. Fantastic item for collector or enthusiast. For sale is this Bubba Gump Shrimp Co Cocktail Shaker & Shot Glass from Las Vegas. Vintage Kitsch Retro Coloured Sherry Shot Glasses x 4 . Stand 7 inches tall No chips or cracks Condition is Used. Dispatched with Royal Mail 2nd Class. London Landmarks. 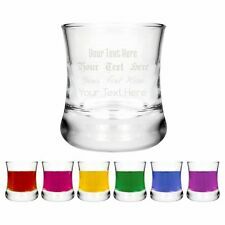 X 4 Small/Shot Glasses-the type you would buy as a souvenir,all feature. Fantastic item for collector or enthusiast. Lovely item in good condition.